NOTES: Limited Production kit from the Czech Republic. Noted as “hand made”, this kit was serialed as number 013. By the mid thirties, foresighted airpower proponents worldwide were well aware that the existing standards for military aircraft of all types were woefully inadequate. At the beginning of the 30’s, wooden Fokker Universals exemplified the state of the art for multi-engined aircraft while at the end of the decade the Boeing 247 was already considered obsolete and aircraft such as the P-38 were reaching operational status. How did all this occur? What were the intervening steps? How did the engineering vision develop? Well, it wasn’t always a smooth progression…. Within the US military, funding was nearly non-existent and rigid standards for each category of aircraft severely restricted what creativity could be brought to each design. Air Corps fighter standards specified an armament of one .30 and one .50 caliber machine guns with a limited supply of ammunition as well as minimum landing speed and runway requirements that were literally based on those of the Curtiss P-1. 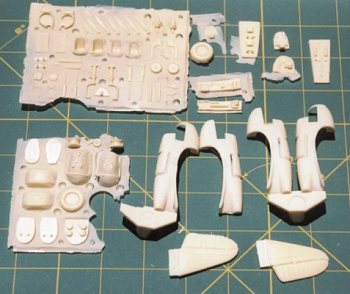 The mold needed to be broken and Fighter Project Officer Lt. Ben Kelsey was ready to do so in partnership with Larry Bell. Want cannons? Very high speeds? Long range? Multi-engined performance? Well, invent a new and as yet undefined category of warplane that does not have to meet existing design straightjackets: the Multi-Place Fighter. Cram as many experimental features as possible into the design to get the maximum benefit from your very limited budget and equip it with the latest engines, turbo-superchargers and engine control equipment. If it’s a success, you’ve got a world-beater in your hands; if not, you’ve learned far more than you would have with another instantly obsolescent design of which only a handful would ever be built anyway. Enter the Airacuda, a mold-breaker if there ever was one. Less than fully successful and with a very short life, the Buck Roger-ish Airacuda served well as an engineering test bed and spawned one of the true all time classic aircraft, the immortal Lockheed P-38 Lightning whose performance specifications were drawn up by Ben Kelsey based on all that was learned with the XFM-1. Oh yeah, the Lightning was another “new category”; the Interceptor… Thank God for people like Ben, Larry and Kelly who save us from ourselves despite ourselves. 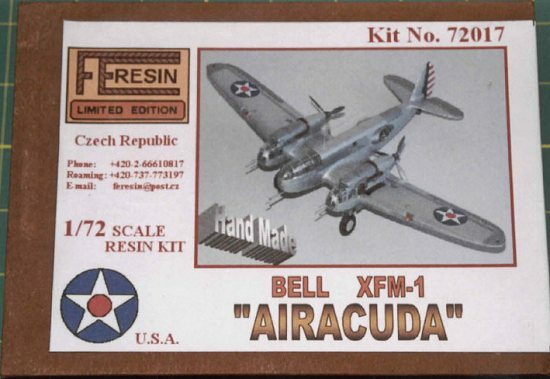 The kit is sturdily packaged with the smaller bits contained in two zip-lock bags while the decal set and main elements such as fuselage halves and wings are unsecured in any manner. The resin seems to be more “rubbery” than most of the other resin kits I’ve seen which will hopefully make it more forgiving to work with. The fuselage is commendably thin, much like a limited run injected kit although this may have resulted in the significant outward warpage of the right fuselage half starting just behind the wing root. Each wing is a single, solid casting with remarkably well-formed wheel wells, no flash and no air bubbles or significant sink marks anywhere. Panel scribing is very good and appears accurate to the photos I have although there is a slight scratching over the entire surface that may have come from an attempt to buff it after it was removed from the molds. This is a concern as the XFM-1 was unpainted and polished and NMF emphasizes every defect. 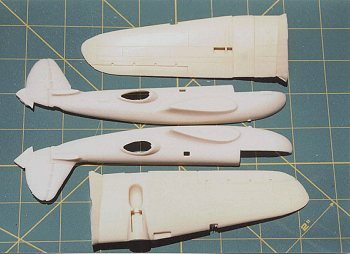 The pusher engine nacelles will likely need significant trimming and careful attention to fit to give a good result. The gear itself is resin and I’m convinced that it is far too weak to support the finished kit. Metal replacements or some other means of support will definitely be required. 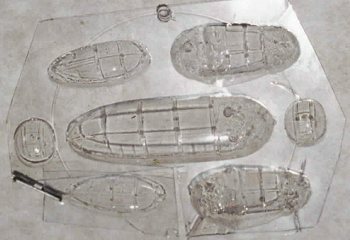 The vacuformed clear bits are reasonably molded, but for the price, a second set should have been included. Like the original, it’s somewhat flawed in execution, but it’s the only game in town except for the long OOP Rare Planes vacuform. If you have the skill, I think it can be a stunning replica of an important and under-appreciated aircraft. For me personally, it’s right on the edge of what I can deal with and I can not fully recommend it to anyone who does not have significant experience with limited run kits. This one is going to sit there for quite a while before I attempt it.